“I brought only one bowl, to remember my mother, to remember Chile”. Plato ceramico is a small, clay dish used for Pastel de Choclo, a sweetcorn pie, popular in Chile. Favoured for their ability to withstand high temperatures, natural aroma and texture, these ceramic dishes are a staple in Chilean kitchens. Powerful vessels of both cuisine and nostalgia, it is objects like these that often find their way accompanying the movement of their owners, not as functioning utensils, but to symbolically pay tribute from one kitchen to another. When Jimena sought refuge in Australia, she brought the dish with her, not actually knowing how to cook the meal it was required for. The ceramic dish embodies both the shared past with her mother, as well as mourning a loss of knowledge transference. “When you go to another country and you live alone, you have to learn everything. It was difficult for me because I lived with my parents and I didn’t have to worry. But coming here and not knowing anyone it was a big change for me”. Jimena and her (then) husband arrived in Australia on March 24th 1989, with a four year old son and a 9 month old daughter. Both strong opposers of the 1973 coup d’état in Chile, Jimena met her husband in the early 1980’s. Politically active and outspoken, he was a political prisoner in a jail where Jimena, a nurse, treated prisoners without adequate access to healthcare. They married in 1983 as soon as he was free but the ongoing threat of persecution continued long after he was discharged. Jimena, no stranger to secret police violence, had already lost one brother to murder, and another was missing. A home visit from the secret police when their son was only a week old, prompted Jimena and her husband to finally leave Chile. In 1985 they applied for asylum in Australia but they did not have permission to fly until 1989. Jimena arrived in Australia, with little possessions, no English or familial support network. 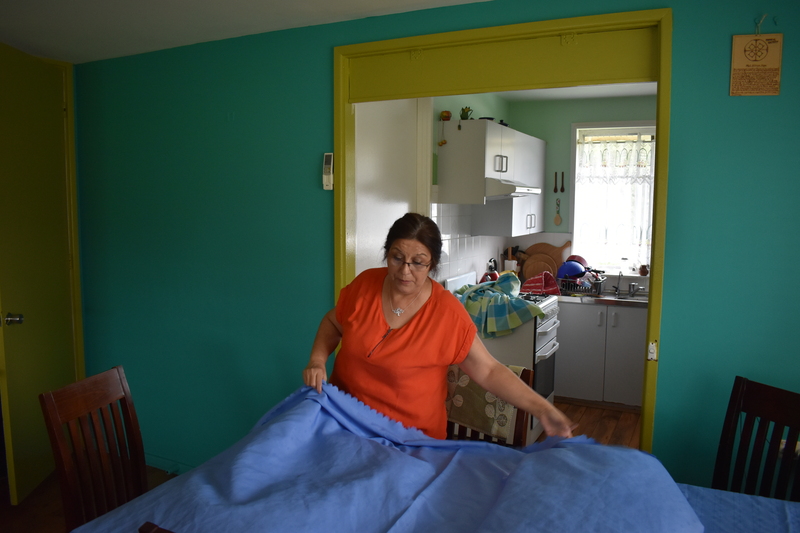 During the first 6 months of their residence, Jimena and her two young children lived in, what was then, the Villawood Refugee Hostel. It was when they moved into their own apartment that the gap in Jimena’s domestic knowledge was realised. “In Chile I lived with my parents and my mother cooked for everyone. My mother would say, that is my kitchen, no one is coming in. I never liked to cook. I was working full time. When I came here, I was staying in Villawood in the refugee hostel. And the food was provided there too. I lived in the hostel for for 6 months and everything was there; breakfast, lunch, dinner. The problem was when I moved to my flat with my two kids. I saw the kitchen, I saw the stove and I thought what happens here? What can I do here? I didn’t know anything”. Culinary learnings materialised under the guidance of Erica, an older Chilean woman. Erica who had already resided in Australia for 5 years, regularly and voluntarily visited the Villawood hostel seeking out Chilean refugees and Spanish speakers, offering them assistance. The two women became close, and when Erica’s busy schedule of work and family commitments prevented her from physically being there for Jimena, she would do so on the phone. Progressively, the gaps in Jimena’s culinary repertoire disappeared. “She would call me everyday by phone and would say what would you like to make today? I would say I want to eat rice and she would say ok this is what you do. She taught me everything. Sometimes she would make suggestions, I am cooking this for my family. Why don’t you try it too? Many times I went shopping with her. She would say, why don’t you buy this one or this one? She encouraged me. She said you need to cook for your kids, for you. She taught me all the Chilean food”. Erica’s phone sessions grounded and refined Jimena’s culinary knowledge while simultaneously complimenting the memories of her mother’s cooking, kitchen and of Chile. Although Jimena’s mother’s kitchen had never been a place of direct learning, it was a social space for family, visitors and collaboration. “In my country it is a big scene when you make Pastel De Choclo. You need to go to the fruit market and buy everything. When you eat it is a family event”. Aided by her new found culinary skills and memory, Jimena was able to recall and recreate her mother’s Pastel De Choclo. Now an avid cook, and a believer in experimentation and improvisation, Jimena never follows recipes and appropriates many of her family’s favourite dishes such as Pastel de Choclo to cater to her daughters’ veganism, substituting meat for tofu and mushrooms. “I won’t be any less richer or poorer in sharing a plate of food”. Although Jimena left Chile before she could learn the culinary secrets of her mother, generosity and humility are traits she inherited. Now an aged care nurse, looking after people with dementia and in palliative care, Jimena attributes her life philosophies to her mother; “I learnt from my mum never to forget where I came from. I live a simple life. I like working”. Jimena is now well known among family and friends for her cooking and regularly hosts ‘Orphan’s Christmas’ at her house, inviting isolated people to join her family meals. After Jimena’s mother passed away a few years ago, Jimena brought some of her possessions back to Australia, among them was the large ceramic plate she used to make the Pastel de Choclo. Jimena fondly recalls always asking her mother why she would always make such large quantities of the pie; “All the time my mum had plenty of food for everyone. She was always taking food to homeless people. She would say, you never know, maybe someone is coming. Maybe someone will knock the door and ask for food”. This is the fourth post in a special series dedicated to my collaboration with Settlement Services International in the lead up to their annual New Beginnings: Refugee Arts & Culture Festival during Refugee Week 2017. A big, warm thank you to the SSI staff and volunteers who have assisted in the project collaboration so far.